This weather has me all confused. This morning as I put on jeans and a pair of long sleeves, I actually thought about starting a small fire in the woodstove and wondered where my knitting bag was. What?! It's June 18th! Hardly time to be thinking about sticky, hot wool and kindling for the woodstove. But before I know it, I'll be dripping in sweat, swearing at our lack of air-conditioning and feeling faint at the idea of turning on a stove or standing over a bubbling pot. 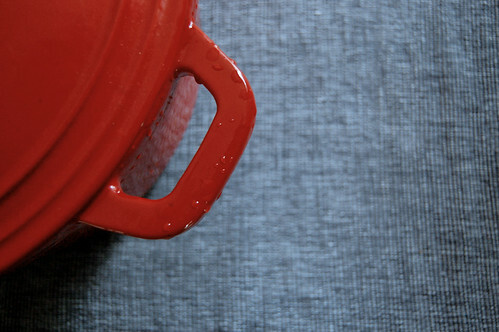 Over the past few months I've become quite attached to the idea of preparing dinner ahead of time–whether it be in the slow cooker, or my lovely red dutch oven, a Christmas gift from my mother. Nothing makes me feel more organized and in control of my afternoons than having dinner slowly cooking away, with just a few last-minute preps to get dinner on the table. Some of my least-glamorous parenting moments come in that wacky hour or so before Dan gets home from work, and I'm scrambling to get dinner on the table. Have you seen the recipe book – Glorious One Pot Meals by Elizabeth Yarnell? I liked it but I don’t have a dutch oven. (yet!) It seems like a neat concept. Everything is layered and cooks in the oven. BLT’s with potato or pasta salad or even chips. I can’t wait to see the other suggestions. Dinner time is the witching hour at our house, baby screaming six year old complaining and so forth. I like to throw some chicken in the slow cooker with barbecue sauce and leave on high a few hours, then low a few hours–then I pull it apart and serve on sandwiches, with coleslaw if I’m really together. It’s tasty, summery, and requires very little effort. I use boneless skinless breasts (thighs would be good too). we love chicken thighs or breasts with a jar of salsa. cook all day on low and shred the meat for delicious burritos or chicken over rice. the other day i seasoned a chuck roast with salt pepper and garlic, browned it, and put it in the crockpot – all by itself – and cooked on high for about five hours. it was delicious. right now i’ve got a chicken carcass in the crockpot for soup stock. i love my crockpot. I like to make up a huge batch of the edf tandoori chicken burgers (with turkey, usually, several pounds of it w/ ginger, garlic, whatever else June -06 I think), form them into patties and even cook them, then just pull them out to eat with pitas, cukes, and yogurt. I’m too hot to cook much hot food in the summer- I try not to turn on the stove as much as possible! Last night we packed up dinner for an outdoor concert, I was looking for things that required no/little cooking, and could basically be eaten with minimal need for dishes and silverware. We came up with rice paper wraps, we filled them with turkey, romaine, avocado, parm. cheese, caesar dressing and some sunflower seeds for crunch. We loved them and quickly started brainstorming other filling ideas and came up with lettuce, shredded carrots, garbanzo beans or cold shrimp or another version w/ sprouts, steamed broccoli and carrots, tofu and teriyaki sauce. We also recently did pulled pork sandwiches in the crock pot. Basically take the pork roast and coat with your fave dry rub put in crock pot with some stock or water for the day. Toast up some buns and slather with the shredded pork and some bbq sauce. I look forward to checking out others’ great ideas as well. Put a few chicken breasts into a crockpot. Open a can of corn, drain, dump over chicken. Open a can of black beans or kidney beans, drain, and dump over the corn. Open a jar (about 16 oz.) of salsa and pour over the top. Cook on low all day. When I get home from work, I remove the chicken breasts and rough shred it (using two forks) then dump it back in, give it a good stir, then put the cover back on. Let it simmer while you set the table. Serve with tortilla chips, sour cream, shredded cheese… whatever floats your boat. Yum-O! and Super easy!! Yesterday, I poached chicken during the day and made some good chicken salad for dinner. I love chicken salad. This is an amazing resource!!! Thanks so much for sharing. I just printed the whole thing out. Mark Bittman is the best :o) And thanks to Molly for asking this question – it is the “witching hour” at our house as well and the day is so much nicer if dinner is done before nap time is over. Leah, We call 1/2 hour before dinner and the hour before bed the witching hour too! A two year old and a three year old–children in general– are crazy when hungry and tired. Don’t you agree? I make two pea soup, split pea with frozen peas thrown in at the end to make it taste fresher. I have put in edemame instead, and that was wonderful. 1. Preheat oven to 425 degrees F. In shallow baking pan toss onion, carrots, celery, and garlic in olive oil to coat. Roast, uncovered, 15 to 20 minutes or until vegetables are lightly browned on the edges, stirring once. 2. In 4-quart Dutch oven combine roasted vegetables, 6 cups water, dry peas, pork hocks, savory, and pepper. Bring to boiling; reduce heat. Simmer, covered, 45 minutes, stirring occasionally. Remove pork; set aside. 3. Stir frozen peas and parsley into soup. Cool about 5 minutes. Transfer soup, half at a time, to food processor or blender. Cover; process or blend until nearly smooth. Return to Dutch oven. Stir in lemon juice. 4. When cool, cut pork off bones. Chop pork, discard bones. Set aside 1/2 cup pork to top soup; add remaining to pureed soup. Heat through. Season with salt and pepper. To serve, top with reserved chopped pork. Makes 6 main-dish servings. Slow Cooker Two Pea Soup: Thaw frozen peas. Finely chop onion, carrot, celery, and garlic (do not roast). In 4- to 5-quart slow cooker combine the chopped vegetables, dry split peas, savory, pepper, and 4-1/2 cups water. Add pork hocks; cover. Cook on low for 9 to 10 hours or on high for 4-1/2 to 5 hours. Remove pork hocks. Place thawed peas, and parsley in a blender. Add about 1 cup of the soup; process until smooth. Stir into soup. Carefully cut pork off bones; chop and add to soup. Season to taste with salt and pepper. Just before serving, stir in lemon juice. Hi there Molly,I’ve tried to send you an email but it doesn’t work. Can you email me? Hi Molly,I have been drawing on others for inspiration in this department. One thing I am trying to do, is cook one meal, and eat for two nights. If I make chicken or any kind of meat, I like to cook a bit extra and then use it for something different the following night (such as wraps, or in a pasta dish).Some of the crock pot recipes I’ve been successful with are:crock pot gyros and korean short ribs. They were both found on this site:http://crockpot365.blogspot.com/Also, I love Blair’s recipe for buttermilk bread here: http://blairpeter.typepad.com/weblog/2009/05/our-bread-and-butter.htmlI’m looking forward to getting some more ideas here. One of my favorites and easiest is Hot Roast Beef – 3 to 4 lb. rump roast, envelope of onion soup, can of golden mushroom soup, and a can of coke. Throw it all in the crock pot on low for 8 to 10 hours and watch the magic happen. Sometimes I throw in onions, potatoes, and carrots for a full meal – or just shred it and serve over bread for an open face sandwich. Yummy! Earlier this afternoon I made pesto with basil from our garden and went ahead and made pasta to go with it for convenience sake. We like this dish warm, room temperature or cold. A great summer make-ahead idea. I will often boil a grain or pasta or chicken in the early morning and stick it in the fridge to make into a salad later in the day. My favorite go to meal doesn’t need any preparation (sort of)…in the summer we love to go the the farmer’s market and buy fresh fruits and veggies, fresh cheese and bread. Then we wash and slice and eat outside with iced tea. Light, summery, fresh, and local! the key for me is having everything ready. i bring home the goods from the csa or the farmers market and wash it all so it is ready to go. that 30 minutes spent at once makes getting dinner together a breeze. we also try to grill as much as possible so the heat stays outside. if we are short on time, it’s sandwiches for dinner! It’s not very summery but I make this Italian Pot Roast often in the winter. It’s from everyday food. http://www.marthastewart.com/recipe/italian-pot-roast?autonomy_kw=italian%20pot%20roastThe leftovers also make yummy sandwiches. My summer favorite is chicken ceaser salad. I just pick up a rotisserie chicken from the store and make up a big salad. Perfect for when we want to do more playing than cooking. Toss all ingredients with dressing and let flavors meld for 10 minutes or so. Serve and enjoy! I love love love pasta dishes. Because Lasagna is a little time consuming I make two batches and put it in 4 8×8 pans and freeze them. That way I can have four times where I flake out on what to make for dinner AND not a lot of leftovers. It goes right from the freezer to the oven. It doesn’t hurt that it’s my grandmother’s coveted recipe! oh you are so lucky the weather is like that. it’s almost 100 degrees with humidity of about 300% down here. but i guess that’s what i get for living on the gulf coast. one of my favorite recipes in the crockpot is actually one i got from 365 crockpot which someone mentioned above. you smoke a pork tenderloin in it!can you believe it? i get the hormel pork tenderloin, the flavored ones are great. you take some soaked wood chips (hickory…yum!) wrap them in parchment paper, poke some holes in the top part of the wrap, throw your pork on top, pour a can of beer, broth, water, whatever you want in there (i believe it’s about half a cup) and throw the lid on. I love pork roast in the crock pot!Fill the crock with 1 inch of water then put in the roast. drizzle on some apple cider vinegar. Coat with favorite seasoning mix. drizzle on some olive oil. Coat the top with apple sauce (this keeps it amazingly moist and tender!). Close the lid and cook low for 6-8 hr. Thirty minutes to an hour before you are ready to eat you can throw in some chopped carrots and potatoes for a one-pot meal. Enjoy!Also, leftovers make wonderful BBQ sandwiches the next day! I’m really not a crock pot girl but these are my 2 top summer favorites. 1. Grilled PizzasI buy premade dough from a local store (Trader Joe’s) or I make my own in the morning and then I portion it into four small balls (I usually make individual pizzas). I turn the grill on high and close the cover so it gets really hot. I cover my hands with olive oil and spread the dough out on a cutting board (paying no attention to the shape). Once I have all the dough stretched and covered with olive oil I lay them on the grill and turn it down to low. After 4 minutes I turn the dough over (should be a little puffy with grill marks) and add the toppings to the grilled side. I let everyone pick what they want…usually leftover pasta sauce or pesto, cheese, and some veggies. Cover and cook for another 4-5 minutes until the cheese is bubbly. It’s great because it takes a short amount of time and doesn’t heat up the house. CarnitasI take a hunk of pork shoulder and cover it with salt on a piece of heavy duty foil, add a few un-peeled cloves of garlic and a handful of cilantro and close it all up. Cook on the grill or in a Dutch Oven for a couple hours until the meat falls apart. Serve with fresh cilantro, salsa, and grilled tortillas. Although you may be funding your local library lately with late fees, I’d recommend checking out the book The Complete Slow Cooker Cookbook by Wendy Louise. I just recently got it from my library and it has great tasting, simple recipes for those busy summer nights when you’d rather spend time with your family. I’m not sure what is going on with your blog at the moment, but I am not getting ANY of your text coming up. I get photos, I get the web page text (like I could click comments and write in this comment box-but where the individual comments should be it’s all white. ) It’s been like this most of the week. No other typePad blog I read is doing it, and obviously there are other people who can read your blog. I have a Mac-not sure if that’s what’s doing it. So bummed not to be able to read your lovely words-I don’t even know what your one simple question is this time!!!! And just so you know- I can’t even see what I just wrote once I post it. Here’s another list from Mark Bittman. 101 simple meals for summer. Anything to simplify our lives a bit. Well, I have a slow cooker that I don’t use much. What I do use, is my pressure cooker. I got it after I returned from one of my trips to Cuba. I saw how easy it was to make a delicious meal using a pressure cooker. My mother in law is a fabulous cook regardless but all her meals were just mouthwatering. So I tend to use it a lot. For instance, I’ll put in some beef cubes, potatoes, carrots, garlic, onions (whatever else you choose) with some spanish seasoning (adobo, cumin) and a bit of oil and it’s ready in 15 minutes. Perfect over rice. I do noodles in it, chicken, and veggies and my kids are happy. That’s what counts!! I know it’s not a “make ahead” meal, but one of my summer staples is BLT’s. I cook the bacon in the microwave, toast some bread, grab some lettuce and tomatos from the garden and we’re good to go.